Cabbage is more than 90% water – is this a good idea? First, for those of you who aren’t Korean, or don’t frequent the adventurous aisles of your supermarket, I will spare a few words for the remarkable food that is kimchi. It seems that at some point in ancient history the good folks of the Korean peninsula thought they should start pickling fermented vegetables in spicy, spicy spices. Kimchi can be made from many vegetables, but most commonly from cabbage. You’ve been served this limp, red-slathered dish in a tiny bowl if you’ve ever been lucky enough to patronize a Korean BBQ (or any Korean restaurant for that matter). If you’ve ever been to Korea you’ve encountered it much more often than that. Kimchi is, in fact, the national food of the Koreans. The food is so important in that nation that it’s more a deeply ingrained cultural element than a food. Your typical Korean serves three or more types of kimchi every meal, including breakfast. Kimchi is to the Koreans what apple pie would be to Americans if Aunt Bea was the tyrannical overlord of our nation. Many Koreans, and this is utterly true, own two refrigerators – a regular refrigerator and a kimchi refrigerator. A separate refrigerator, you understand, that they need to own so they have a place to keep all their kimchi. To your average American, kimchi is something of an acquired taste. We don’t pickle as much as we used to, and cabbage was never on the menu even back when pigs feet were going in the brine. Add to that fermentation in red hot spices and it starts to become clear why kimchi isn’t more widespread in the states. So if that’s Kimchi’s illustrious, if idiosyncratic, past what is Trader Joe’s thinking by drying it? I really can’t get over how crazy this idea is. Unless there was a protracted, filibustering exhibition of super-human showmanship, I have great difficulty imaging the board meeting where this idea was successfully pitched. Essentially, someone must have stood up and said, “We want to start dehydrating cabbage,” and every just looked at each other and nodded. How does that happen?! This is 2013 – are all our pretenses to enlightenment a hollow lie? Let me reiterate – I like kimchi. I’m a guy who literally says, “Alright, kimchi!”, when it’s served to him. I’ve willingly purchased whole jars of kimchi and brought them home with me. This is not a weird food to me, this is something I like. But I do not like this. Dried kimchi is, essentially, a bitter dose of spices on a shrunken leaf wad. It falls into the category of foods so weird I can’t even like them for their weirdness. As we’re all aware, cabbage is 93% water content, and the bits that aren’t water are more tolerated than celebrated. Not many people are walking around hefting heads of cabbage and biting off a big mouthful just for the flavor. Really, dehydrating cabbage is just a fancy way of throwing it away. The fact that the already intense kimchi spices get concentrated in equal intensity on these dry bits of leaf is not a selling point. The bag advertises the dehydrated kimchi as a “snack and condiment”, but a snack it is not. 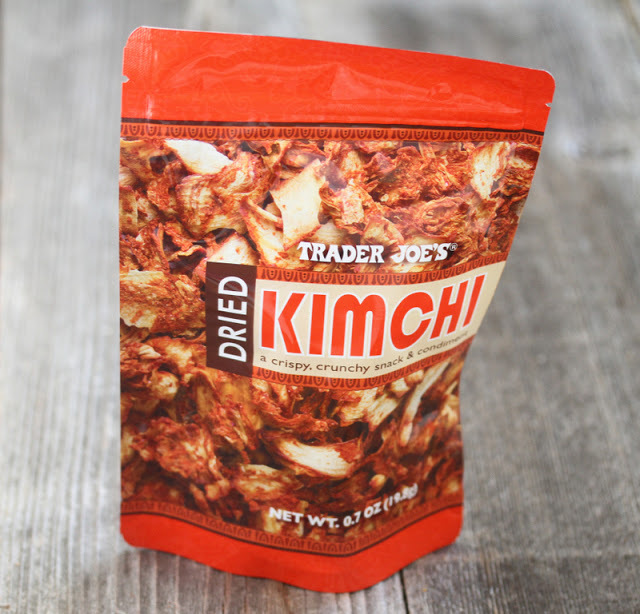 Dried kimchi is something you take a small pinch of, chew on slowly, and regret your recent life decisions. It’s more bitter than anything, although it’s also tremendously spicy. As a condiment, the dehydrated kimchi fares better. The bag makes several suggestions for working the product into your daily life, some of them ludicrous, but includes “soup” and “salad” among them. Dried kimchi flakes on salad is not something I would encourage. If you set out to design a salad entirely around the dried kimchi flakes, I dare say you could manage it. If you simply sprinkle them on a standard garden salad like I did, your results will be less than stellar. The gnarly cabbage-ness of the flakes blends away into your other leafy greens, but the touch of bitter spiciness still stands out, clashing with the other, more dominant flavors in the salad. Soup, I’m glad to say, fares much better. I sprinkled my kimchi on Trader Joe’s Spicy Seaweed Ramen and actually found the dish much improved. The ramen, though tasty, is fairly simple in flavor. Seaweed doesn’t contribute much to it in terms of taste, and the spicy broth is simple and straight forward without depth. Adding dehyrdated kimchi improved the whole situation. When the kimchi contacted the broth it began to reconstitute and unfurl, essentially undoing the damage done to it by Trader Joe’s mad kitchen scientists. With a little moisture and life returned to it the kimchi fares much better – infusing the soup with it’s complex, tangy, spicy flavor. This was the only way the dried kimchi seemed edible to me – if TJ’s is serious about keeping this stuff on the shelf they should try and play up this angle. As good as the kimchi was as a soup additive, it made me wonder “Why not just add regular kimchi to the soup?” If I’m in the market to buy some kimchi, and it comes down to dehydrated or regular, I’m going to go with regular every time. Not only can it be incorporated into more meals than the dried kimchi, but it’s cheaper per pound, and even stores better – a jar of kimchi will last in your fridge for as long as you need while the dried kimchi starts to degrade in quality as soon as the airtight bag is opened. Overall, this is a weird exercise in food absurdity – almost an art project. If, like me, you actually like kimchi, do yourself a favor and just buy the regular, non-dehydrated stuff. Would I Recommend It: Only to die-hard kimchi fans looking for another way to get that kimchi-fix. Would I Buy It Again: Oh no. No, no, no. Final Synopsis: Dehydrating cabbage is a bad idea.